Single Fully Customized Bobblehead - Personalized Bobblehead & Cake Toppe: This design is part of our Fully Customized Collection. Find the best selection of high-quality Collectible & Personalized Bobbleheads available anywhere. Custom Bobbleheads & Personalized Bobbehead, Wedding Custom Bobbleheads, Bobble Head Gifts, Fallout Bobbleheads, Groomsman & Bridesmaid Gift, Wedding Cake Toppers, custom bobble heads, bobble head toys, pop bobbleheads, bobble head dog, wobble head, bobble heads, personalized dolls, bobbleheads custom, bobble head dolls. Fully customized designs allow you to fully personalize the body structures, poses and clothing styles – everything on the bobblehead from head to toes. Please note that the fully customization design option does not include the addition of props of any size for free. Please contact us to get a quote if you are interested in including a prop as part of your design. DESIGN TIMELINE: The Standard design process takes approximately from 4 to 6 weeks to be completed plus 2-3 additional business days for delivery. Unless you purchase the Rush Design Order AddOn option, you should expect to have the final product delivered in approximately 7-8 weeks. Please note that this is simply an estimated timeline since the more revisions you request to be made during the proofing stages, the longer the design process will be. The above estimated timeline assumes only 1 revision request throughout the entire design process. This applies to both Standard and Rush orders. Custom Bobbleheads & Personalized Cake Toppers & Figurines are ageless, timeless and can suit any occasion or any theme. Be it a wedding, engagement, birthday party to Valentines days, or just for the special "him", "her" or "it" in your life. We can hand-craft an immortalize work of art in the likeness of any Bride & Groom, friend, co-worker or family member. Give this one-of-a-kind gift today and rest assure that you will be remembered forever! Looking for a unique, custom made gift for someone you love? Give the only present that's all about them! Here's something which can make every head turn and every heart blossom with the fond memories that personifies the gift at all times. We do want our customers to be satisfied with the purchase and in order to achieve that goal, we strongly believe that the customer should be part of every single step of the process from start to finish. The design process is a collaborative effort between you, the customer, and us, the design team. We have 3 professional design teams around the world: Europe, Asia and South America. Depending on the pre-made design you've chosen from our extensive portfolio, we'll assign a specific design team to work on your order. All the communication must be conducted via email - this includes, but it's not limited to, photograph submission, personalization coordination and proofing phases. The entire process starts about 2 to 3 business days after all the detail photographs have been submitted to us, reviewed and approved by us and we have informed you that the design process has been started. As soon as we have the first set of proofs, we will contact you via email and provide you with detail shots of the work in progress for your corresponding review and comments. These initial detail proofs are often of the head(s) in the raw form usually wax/clay-sculpted We will always require your review and approval in writing prior to moving to the next stage of the process. Please allow up to 8 business days from revision to revision. Please note that all facial characteristics such as smile, front and back hair style, eye and mouth shapes, cheek and jaw lines must be carefully reviewed during this initial stage of the design process. All the revisions are completely free of charge and you can request them until you are fully satisfied. Once the proofs are approved and the next template molding, baking and painting design stages are started, any modifications will require to start the entire sculpting and painting processes over again. If that was the case, unfortunately there will be a $25 charge per bobblehead. As mentioned above, the more revisions you request to be made during the proofing stages, the longer the design process will be. As you review the provided head proofs, please take into consideration that the nature of a bobblehead, unlike those of a figurine or bust, is that the features of the person being sculpted are exaggerated but yet keeping the likeness very obvious. On a bobblehead, the face and head features are not proportional to that of the body. By definition, it's more to the cartoonish side. If you are looking for a photographic replica of the person being sculpted, this is probably not the type of product you are looking for. Custom body design and proofing are handled the same way as that of the head(s). Once completed, detail shots of the work in progress will be emailed to you for your corresponding review, comments and approval. As soon as the head(s) and body(ies) are fully reviewed and approved, we will cast the resin in the mold and paint the entire sculpture for the final color proofing. Once you are fully satisfied and, after the final written approval is received, we will ship your order. Unlike our competitors, we DO NOT use Polymer Clay to sculpt our bobbleheads. Polymer Clay is a cheap, low-quality, pre-colored sculpting material which, under normal conditions, dries out out and cracks very easily. We handcraft our bobbleheads with 100% Polyresin material which is a high-quality resin compound generally used for statues, figurines, and decorative furniture. Our design quality, professional craftsmanship and detailed finishing are second to none and the best in the industry. Lowest price, most sales and best customer satisfaction of any bobblehead company. You don't have to pay extra to make the head bobble. It's a bobblehead after all. Fully insured Express shipping and door-to-door delivery. Price Match Guarantee. We'll beat the bobblehead off of any competitor out there! Simply contact us if you happen to find a lower price and we'll match it - Guaranteed! For more in-depth information about each of these differentiation facts, please scroll down to the section labeled "Detailed Description of What Makes Us the Best Choice"
STEP 1. Choose your preferred Pre-made Body Style & Pose and add it/them to your shopping cart. Clothing Style Changes: "Change Clothing"
Body Structure and/or Pose Changes: "Fully Customized"
STEP 3. Once everything is in your Shopping Cart, please proceed to Checkout and follow the instructions on the screen. Upon placing your order, you will receive an Order Confirmation email message along with detail instructions as to how and where to send us the photographs and personalization information. Please note that the better the quality of the photographs you submit, the better we can see the nuances of your faces and the more resemblance you will find in the face proofs. For the complete Photograph Submission Guidelines documentation, please contact us at CustomerService@MyCustomBobblehead.com. We will be more than happy to provide you with all the information you need in order take and submit your photographs. Our bobbleheads are handcrafted with 100% Polyresin material. Polyresin is a resin compound generally used for statues, figurines, and decorative furniture. This material could be painted with any color you desire. If needed, the color tone could be easily adjusted at any time during the painting design phase. Most of the other companies use Polymer Clay which, besides being a cheaper and low-quality sculpting material, it has a pre-defined color and texture similar to those of kids' play-dough. Please read carefully their coloring and finishing disclaimers and you will realize that once the sculpting process is started with a given color, the final color tone is pretty much locked skin or any other color changes cannot be made. Furthermore, just like kids' play-dough, the fingerprints of the sculptor will be shown all over the finished product. This fact is also mentioned in our competitors' product disclaimers. Please read them carefully and choose wisely! If you have taken the time to look at other companies' product offerings, you may have noticed something very obvious - even for the untrained eye - their products look as though they are the result of a middle school play-dough art project. I don't know about you, but if I'm paying a substantial amount of money for a personalized bobblehead, my expectation is to have professional sculptors, with decades of experience, work on my design. We are the Bobblehead company that has the most sales by far and an unbeatable 5-star rating record. Please take a moment to read our customers' reviews and see what they had to say about their positive purchase experience with us. Because of the high volume of orders we receive not only through Etsy, but from other marketplaces around the world, it allows us to set our pricing to be very competitive and the lowest in the industry - period. Please compare us! If you find a lower Total Sales Price on an identical handcrafted single/double pre-made/fully customized product, please contact us at CustomerService@MyCustomBobblehead.com and provide us with the link to the competitor's web site for our review and consideration. For additional information, please see our "Price Match Guarantee. We will not be undersold section". Unlike other bobblehead companies, we do not have any hidden fees or additional payments required to make what it's supposed to be the nature of bobblehead a bobble head! Their enticing pricing advertisement does not make any reference to the extra cost you would have to endure to make the head movable. 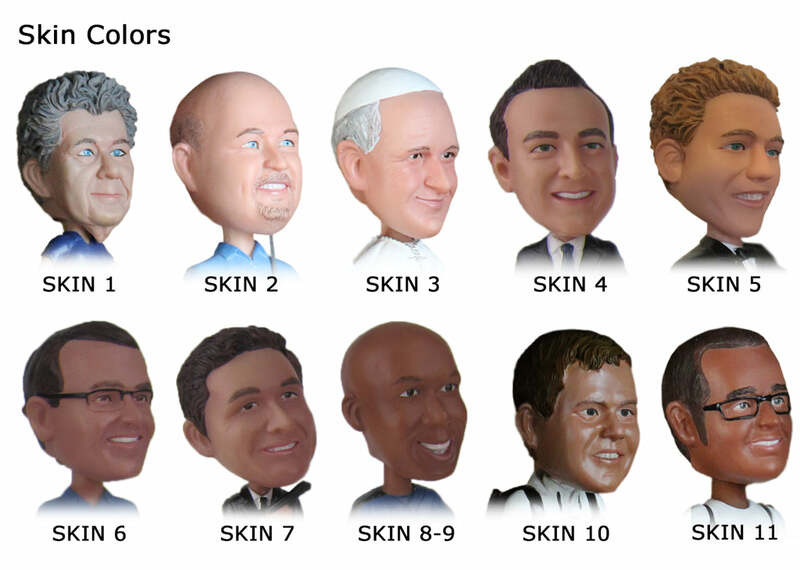 Our pricing, which by the way is much lower than theirs, includes both options static and bobbly heads. You decide what kind of head type you would like us to design at no extra cost to you! Our products are fully insured against any mishandling during shipment. Due to the fragile nature of the product, we use a worldwide white glove, door-to-door and signature required shipping carrier. Although this is very uncommon, accidents happen during transit. If for any circumstance, the product arrives damaged we will replace and ship it free of charge. Unlike other bobblehead companies, we create a mold template of your design during the second phase of the design process. If needed, we could simply refill the mold and have an identical copy of your approved design ready to be shipped within days. 6. PRICE MATCH GUARANTEE - WE WILL NOT BE UNDERSOLD! If you find a lower Total Sales Price on an identical handcrafted single/double pre-made/fully customized product, please contact us at CustomerService@MyCustomBobblehead.com and provide us with the link to the competitor's web site for our review and consideration. We'll beat the bobblehead off of any competitor out there! Please note that the Total Sales Price of the competitor must be based on the same personalization options you are interested in purchasing from us. This includes but it is not limited to the following: product size, color customization, logo, prop and accessory additions, and shipping cost. For additional details and restrictions, please visit the Shipping & Policies sections. Due to the personalized nature of our products, once the design process has been started, the order cannot be cancelled or refunded. There will not be any exceptions made as there is cost associated with every single phase of the design process. We do reserve the right to refuse or cancel an order for any reason and at any time including limitations on quantities available for purchase, inaccuracies, or errors in product or pricing information, or lack of clear and timely communication and/or refusal to provide additional revision details during the design proofing stages. For additional information, please visit the Shopping Policies section.